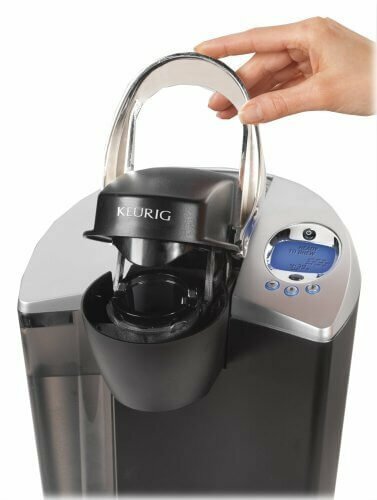 The Keurig K60/65 Special Edition Single Serve Brewing System is perhaps the most popular single serve coffee maker in the market today. It has been on the Keurig line-up for many years, and still attracts the attention of coffee-lovers who desire an easy-to-use system at home or office, that is both reliable, reputable and serves a good cup of coffee on every use. This model is been used in thousands of households and offices all over, so we thought to discover in depth about why it is so popular. Initially, once the machine is filled with water, it takes approximately four minutes for the water to heat up. During this period, the red light next to HEATING on the LED Control Center will illuminates. Once the water gets heated, the red light turns off and the Small Mug Button light flashes. Pressing the Small Mug Button to starts the cleansing brew. After that, pour the hot water into the sink. The Brewer may take 15 seconds to reheat water between brews during which time the red light next to HEATING on the LED Control Center may be illuminated. When the water has heated, the red light will turn off. This is the one-time set-up process on starting the machine and now you are ready to brew. Keurig K60/65 Special Edition Brewing System is a beautiful creation. Its design is sleek and modern with chrome accents that look fantastic on your kitchen counter. It is very easy to use. Simply choose your K-cup pod, insert, set to brew and your coffee, tea or chocolate is ready in no time! This unit is also very quick. It lives up to its promise of coffee in under a minute. It has 3 brew sizes, 6,8 or 10 oz with adjustable brew temperature. Your coffee choices are wide and varied with over 250 K-cup varieties at your disposal. You can control the temperature of your coffee, making it as cool or warm as you’d like, up to 192 degrees. The removable drip tray allows for different cup sizes to fit. This is great for people who’d like to have their coffee in a travel mug while on their way to work. You have the option to purchase a K-cup filter and use your own preferred coffee, instead of using the K-cup pods. The quiet brew technology really works! It’s one of the quietest pod coffee machine we’ve ever used, which is a nice change from the loud, noisy machines that we usually come across. It’s a little on the pricey side for a single serve coffee maker at US$150. If you prefer your coffee to be piping hot, this unit will disappoint you. The maximum temperature is 192 degrees, which cools very quickly. Large cups of coffee, 10 ounces say, will be weak because the pods do not allow for adjustment of the amount of coffee, only the amount of water. So the same amount of coffee that is used to brew a 6-ounce cup will be used for a 10-ounce cup, resulting in significantly weaker coffee. So if you want a large cup of strong coffee, you would have to brew two small cups and combine them. With few removable parts, cleaning this machine is not as easy as it could be. The K-Cups are not 100 % disposable and contribute to environment thread in some way as these are being used by many all over. It is only suitable for home and small offices as it takes 15 seconds to reheat the water for every use. If you’re looking for a quick, convenient and easy-to-use single serve brewing system, then the Keurig K60 Special Edition is a great choice above it’s other models. It operates as promised and will deliver a rich, flavorful cup of coffee in a minute or less with just the press of a button. Buy now and get a 12 K-cup variety pack absolutely free. 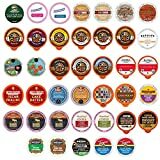 The wide variety of K-cups makes it especially attractive, so you will always have different options to choose from, and new brews to try out. Our major concern with this machine is the limitations on brew strength for larger cup sizes. Many big coffee drinkers might not be happy with the weak brew that a single K-cup pod delivers to a 10-ounce cup. Though brewing 2 smaller quantities and combining them can rectify this, it can prove to be costly since you will have to use two K-cup pods. 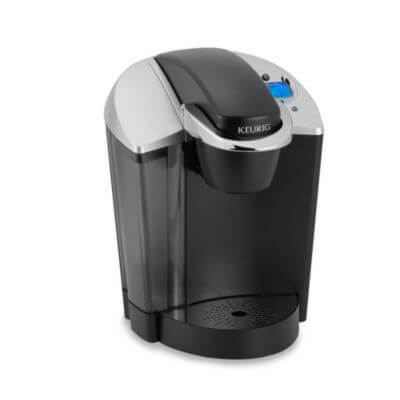 Nonetheless, the Keurig K60 is an impressive single serve brewing system that we would recommend for your home or office. In this K60 review, we rate this machine an impressive 4 out of 5 stars. We would have given it 4.5 stars, but it’s because of the weak brew in the larger cup sizes. Still 4 stars is already a very good rating. Will you follow our recommendation and buy the Keurig K60 Special Edition Single Serve Brewing System, or do you have another coffee machine in mind? If you are a long time owner of this machine, or newbie to single serve machines you are welcome to share your experience with us in the comments section. We would love to hear from you!